Family pedigrees seem to be confusing things, because there are two distinct interpretations of the expression "family tree". First, the pedigree tree could be drawn with a particular contemporary person at the root of the tree, so that the tree expands backwards in time to increasing numbers of ancestors at the leaves (ie. an "ascent tree"). In some ways this seems quite illogical as an analogy, given that the base of a real tree is the origin of its growth. Pedigrees are generally somewhat different from phylogenies, but in phylogenetics we do choose the latter option for interpreting trees — we start with a collection of contemporary leaves and try to reconstruct the tree backwards towards the common ancestor. Thus the root is at the "base" of the tree, even when we draw the root at the top of the diagram. In popular usage these distinctions are often blurred. 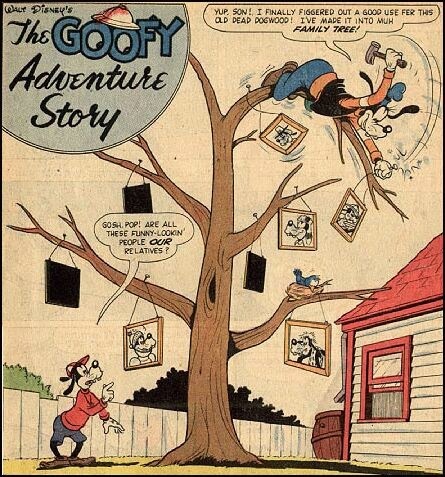 Consider this "family tree" of the Disney character Goofy. It is taken from Gilles R. Maurice's Calisota web page, where the character names are listed clearly. This is based on the first usage described above, since Goofy himself is at the base and his ancestors are at the leaves. This is actually closer to a lineage rather than a tree, especially as no females seem to be involved at any stage. However, roughly the same information can be presented the other way around. This cartoon is taken from a different Calisota page. 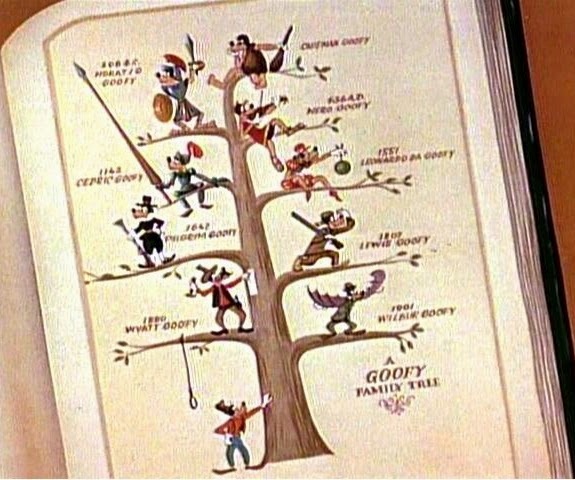 Here, Goofy is now at the top of the tree and his ancestry proceeds downwards, with the oldest ancestor at the base (except for his son!). This really is confusing.